Mesotheliomas usually involve the serosal membranes of the pleura and peritoneum. 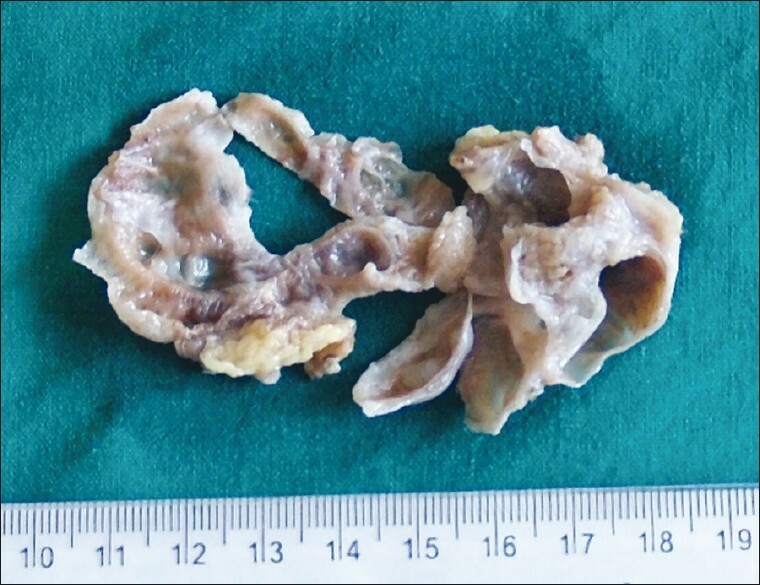 Rarely a mesothelioma is found within the tunica vaginalis of the paratesticular region. We present a case of lesion in a 48-year-old man who came with a 4-week history of scrotal swelling and pain. Physical examination revealed an enlarged left hemiscrotum containing a fluid-filled structure that was transilluminated. Testicular ultrasonography was suggestive of an epididymal cyst with a large left-sided hydrocele. Following this the patient was posted for eversion of the hydrocele sac. During the operative procedure, a large cystic mass was seen adherent to the surface of left testis and epididymis. The lesion was excised and sent for histopathological examination. Grossly, the mass measured 5 × 5 × 2 cm and consisted of a multilcystic translucent lesion containing clear watery fluid [Figure 1]. Histopathological examination revealed multiple small and large cystic spaces lined by flattened to cuboidal mesothelial cells. 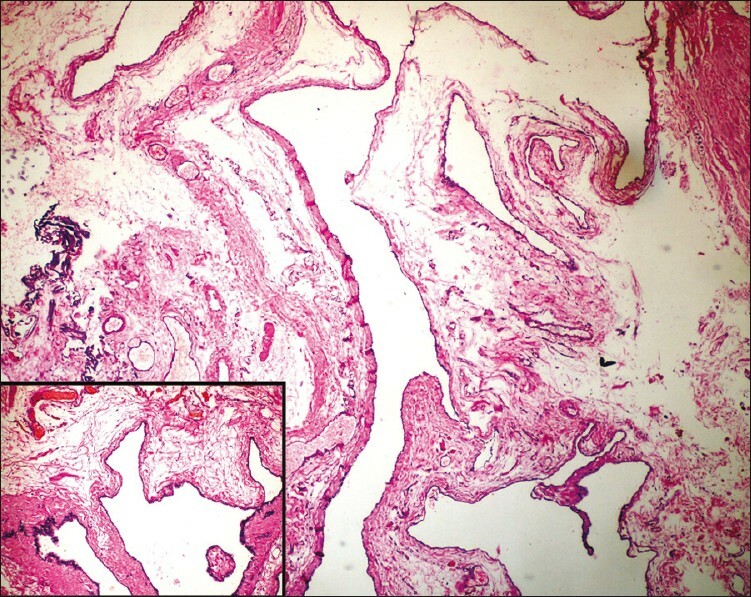 The cystic spaces were separated by loose fibrocollagenous tissue showing mild chronic inflammatory infiltrate and a few congested blood vessels [Figure 2]. 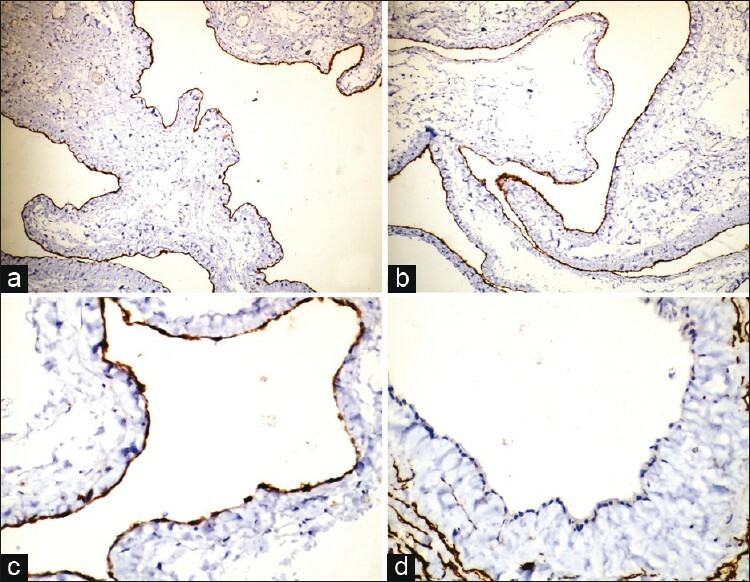 Immunohistochemically, the cyst lining cells were reactive for cytokeratin, calretenin, and epithelial membrane antigen, and negative for CD34 [Figure 3]. Based on the above features, a diagnosis of multicystic mesothelioma was offered. 1. Cabay RJ, Siddiqui NH, Alam S. Paratesticular papillary mesothelioma. Arch Pathol Lab Med 2006;130:90-2. 2. Bisceglia M, Dor DB, Carosi I, Vairo M, Pasquinelli G. Paratesticular Mesothelioma. Report of a Case with Comprehensive Review of Literature . Adv Anat Pathol 2010;17:53-70. 3. Mesothelioma. In: Weiss SW, Goldblum JR, editors. Enzinger and Weiss's Soft Tissue Tumors. 5 th ed. Philadelphia: Mosby, Elsevier; 2008. p. 789-823. 4. Chien AJ, Strouse PJ, Koo HP. Cystic mesothelioma of the testis in an adolescent patient. J Ultrasound Med 2000;19:423-5.